wherein R═CH 2OSiMe2(t-Bu), or a pharmaceutically acceptable salt thereof. 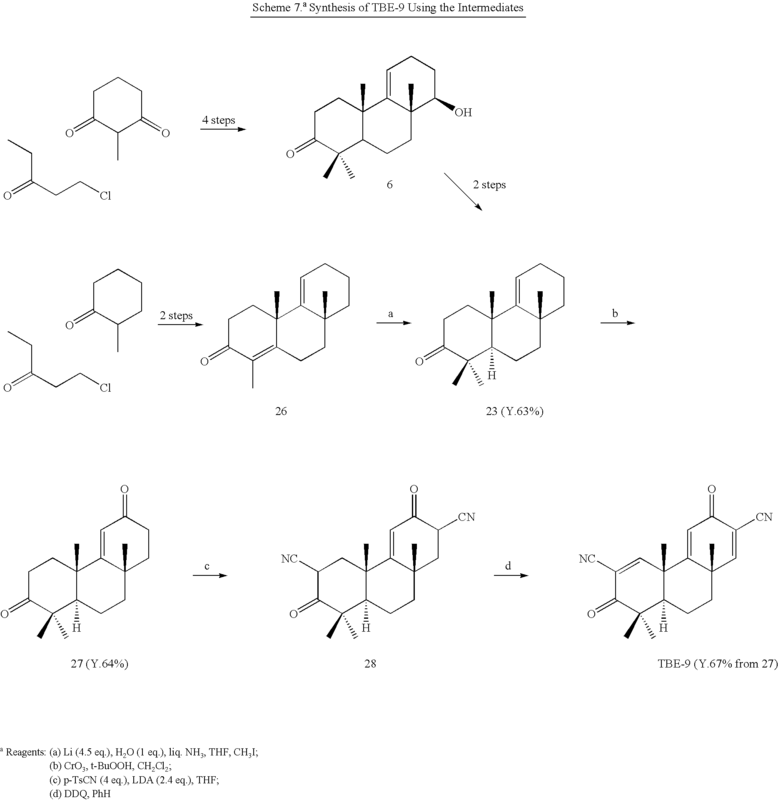 Also provided are various tricyclic-bis-enone compositions, comprising one or more of the compounds described above, effective for inhibiting IFN-γ-induced NO production in macrophages or RAW cells, the composition having an IC 50 value of at least less than about 0.7 μM. In specific embodiments, the compositions may have an IC50 value of at least less than about 0.1, 0.05, 0.01, 0.005, or 0.001 μM, be optically pure, be predominantly the (+) enantiomer, predominantly the (−) enantiomer, or a racemic mixture. The composition may further be water soluble. As used herein, the term “electron withdrawing moiety” is known in the art, and refers to a group which has a greater electron-withdrawing than hydrogen. A variety of electron-withdrawing groups are known, and include halogens (e.g., fluoro, chloro, bromo, and iodo groups), nitro, cyano, —NR 3 +, —SR R2 +, —NH R3 +, —SO2 R, —SO2 Ar, —COOH, —OAr, —COOR, —OR, —COR, —SH, —SR, —OH, —Ar, and —CH2CR2, where Ar is aryl, and R represents any appropriate organic or inorganic moiety and, preferably, alkyl moiety. 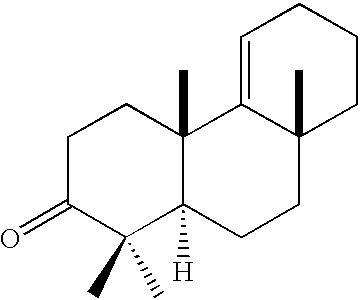 As used herein, the term “halosubstituted alkyl moieties” is intended to include alkyl moieties which have halogen moieties in the place of at least one hydrogen. As used herein, the term “amino” means —NH 2; the term “nitro” means —NO2; the term “halogen” designates —F, —Cl, —Br or —I; the term “thiol” means SH; and the term “hydroxyl” means —OH. Thus, the term “alkylamino” as used herein means an alkyl group, as defined above, having an amino group attached thereto. The term “alkylthio” refers to an alkyl group, as defined above, having a sulfhydryl group attached thereto. The term “alkylcarboxyl” as used herein means an alkyl group, as defined above, having a carboxyl group attached thereto. The term “aromatic group” is intended to include unsaturated cyclic hydrocarbons containing one or more rings. Aromatic groups include 5- and 6-membered single-ring groups which may include from zero to four heteroatoms, for example, benzene, pyrrole, furan, thiophene, imidazole, oxazole, thiazole, triazole, pyrazole, pyridine, pyrazine, pyridazine and pyrimidine, and the like. The aromatic ring may be substituted at one or more ring positions with, for example, a halogen, a lower alkyl, a lower alkenyl, a lower alkoxy, a lower alkylthio, a lower alkylamino, a lower alkylcarboxyl, a nitro, a hydroxyl, —CF 3, —CN, or the like. The term “amino,” as used herein, refers to an unsubstituted or substituted moiety of the formula —NR a Rb, in which Ra and Rb are each independently hydrogen, alkyl, aryl, or heterocyclyl, or Ra and Rb, taken together with the nitrogen atom to which they are attached, form a cyclic moiety having from 3 to 8 atoms in the ring. Thus, the term “amino” is intended to include cyclic amino moieties such as piperidinyl or pyrrolidinyl groups, unless otherwise stated. An “amino-substituted amino group” refers to an amino group in which at least one of Ra and Rb, is further substituted with an amino group. As used herein, the term “IC 50” refers to an inhibitory dose which is 50% of the maximum response obtained. TBE-3-5 show significant inhibitory activity (IC 50=0.01 μM level) on NO production induced by IFN-γ in mouse macrophages (see Table 1). 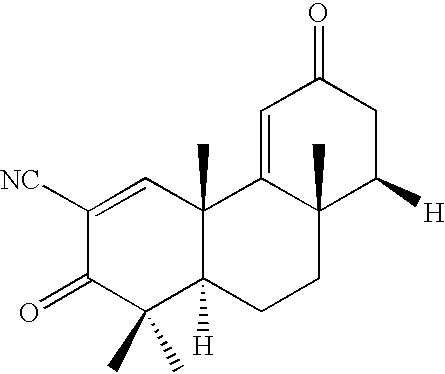 The potency of TBE-3-5 is similar to that of hydrocortisone although they do not act through the glucocorticoid receptor (data not shown). TBE-3-5 were more potent than TBE-1 and 2. This result suggests that the bis-enone structure is very important for high potency in even relatively simple molecules. 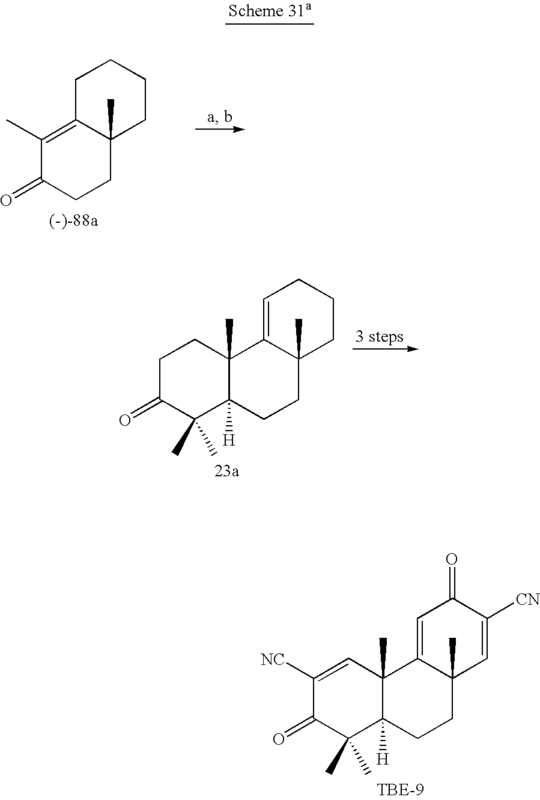 Optically pure (4aS)-(+)- and (4aR)-(−)-1,4a-dimethyl-4,4a,7,8-tetrahydro-naphthalene-2,5(3H,6H)-dione [(+)- and (−)-12] were prepared via achiral intermediate 11 from ethyl vinyl ketone (2) and 2-methyl-1,3-cyclohexanedione (3) by a known method (Hagiwara et al., 1988). 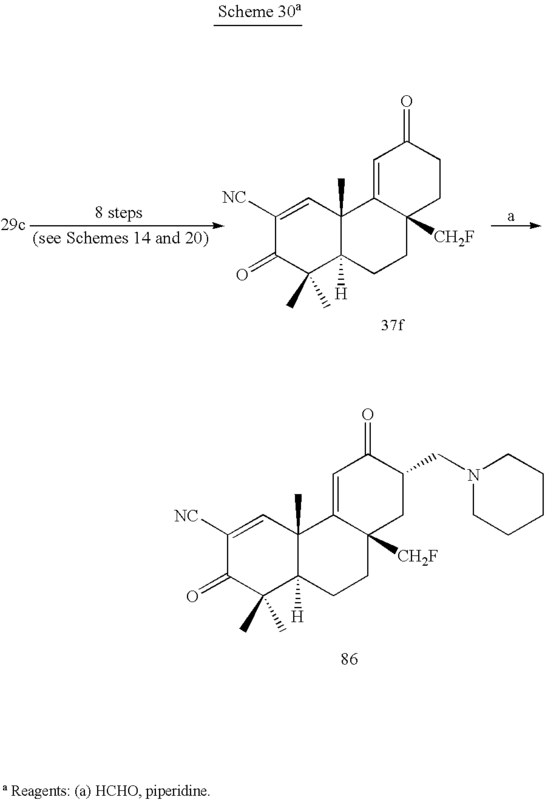 Enantiomer (+)-6 with the same configuration as naturally occurring triterpenoids and its antipode (−)-6 were synthesized from (−)- and (+)-12, respectively (Scheme 2) according to the same sequence as for racemic 6. The enantiomeric excess of each enantiomer was determined to be 90% by  1H and 19F NMR of the (−)-R-MTPA ester (Dale et al., 1969) derived from each enantiomer. Both enantiomers of TBE-5 were synthesized from (+)- and (−)-6 according to the alternative route shown in Scheme 3. 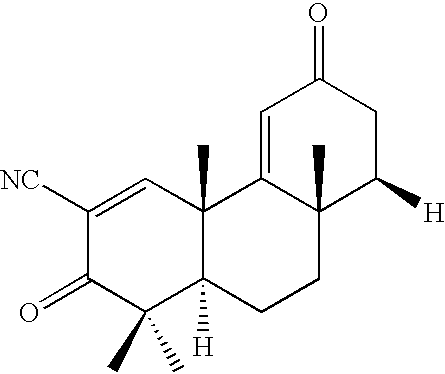 Acetylation of (+)-6 gave (+)-13 in quantitative yield. Allylic oxidation of (+)-13 gave (+)-14 in 79% yield. 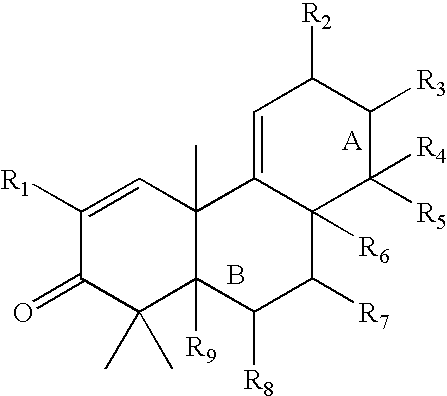 Deacetylation of (+)-14 with DBU gave (−)-15 in 97% yield (Srikrishna et al., 1998). Cyanation of the enolate of (−)-15 with p-TsCN in THF gave (−)-16 in 93% yield (Kahne et al., 1981). 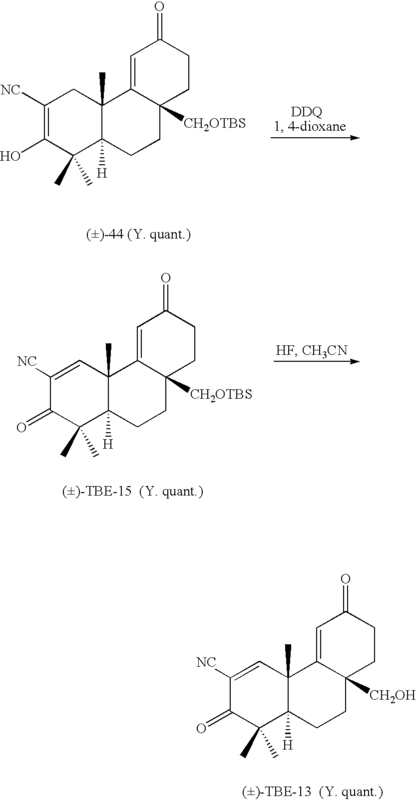 DDQ oxidation of (−)-16 gave (−)-TBE-5 ([α] D −115°, CHCl3) in 73% yield. Overall yield of (−)-TBE-5 from (+)-6 was 52%. Because, in the former route (Scheme 1), the overall yield of TBE-5 from 6 was only 14%, the yield was much improved by this route. (+)-TBE-5 ([α]D +115°, CHCl3) was also synthesized by this sequence. 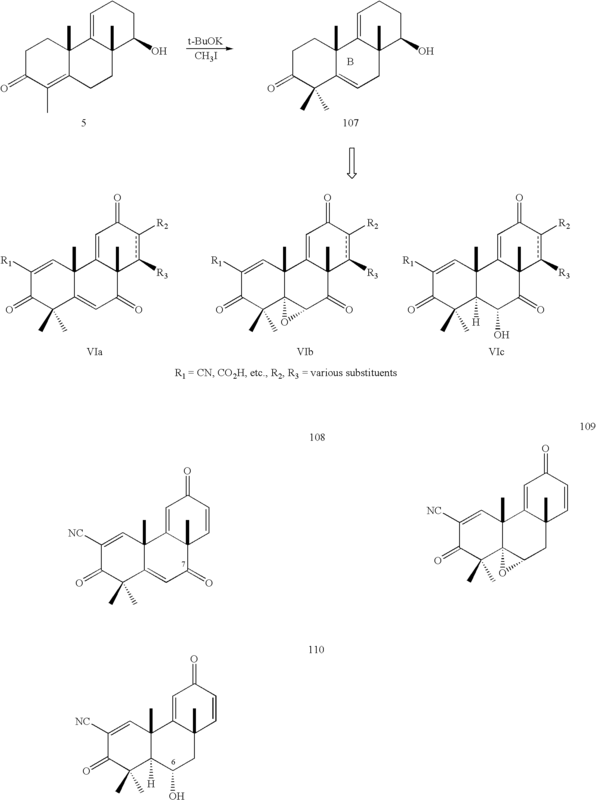 Ketal 17 was synthesized in 93% yield by ketalization of 6, followed by oxidation. 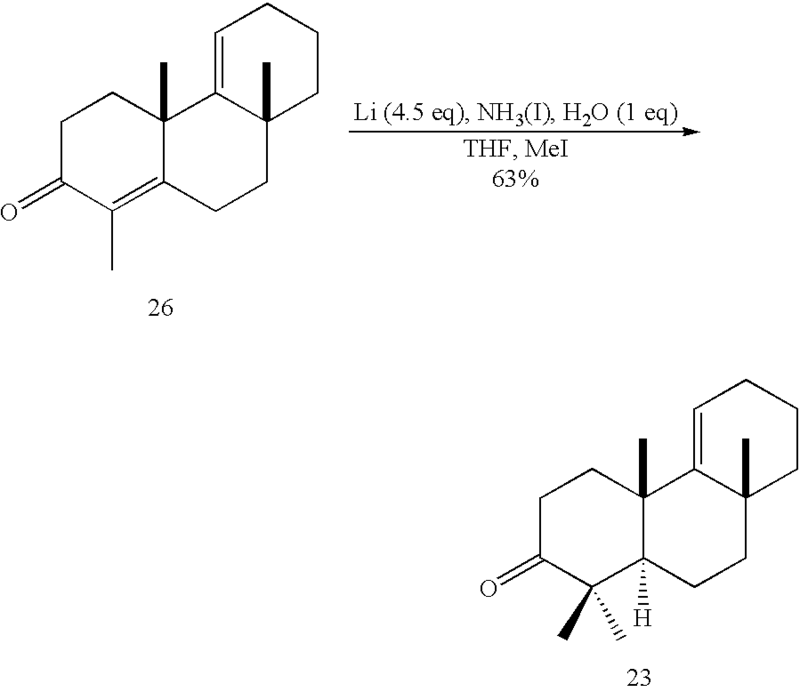 Ester 18 (a mixture of two epimers) was prepared in 71% yield from 17 by methylation with Stiles' reagent (Finkbeiner et al., 1963) and subsequent methylation, followed by reduction with NaBH 4. 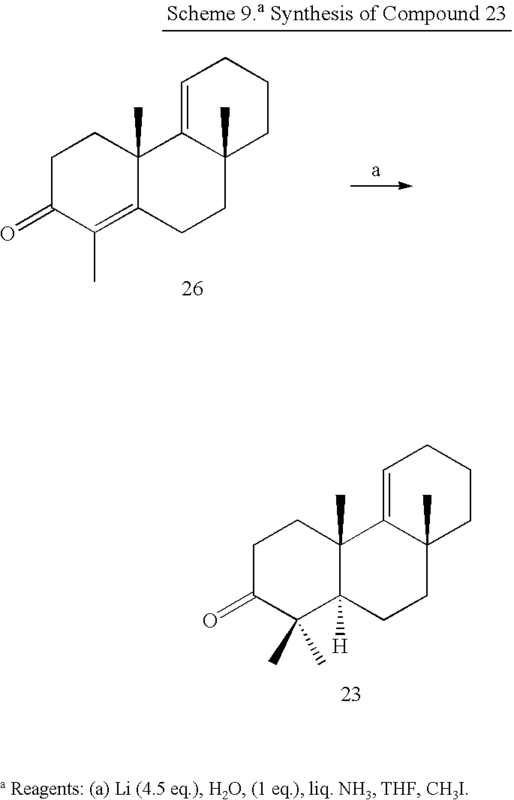 Deketalization of 18, subsequent mesylation of the hydroxyl group at C-14, followed by dehydration with DBU gave 19 in 74% yield (Hirota et al., 1991). 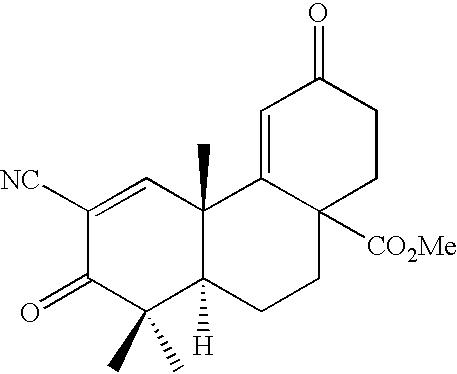 Isoxazole 20 was obtained in 97% yield by formylation at C-2 of 19, followed by condensation with hydroxylamine. 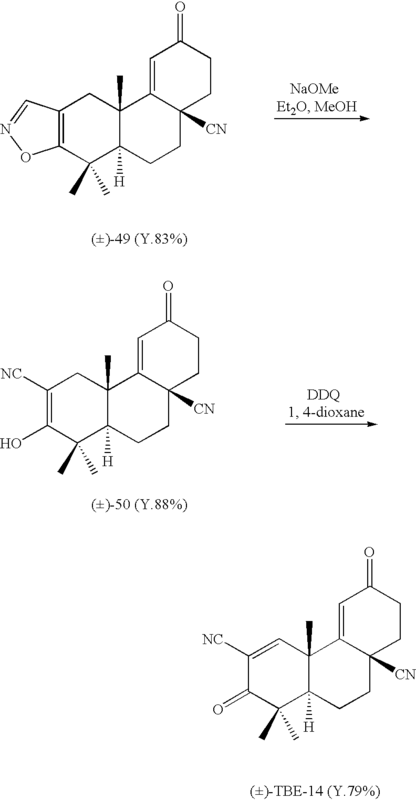 Allylic oxidation of 20 gave dienone 21 in 58% yield. 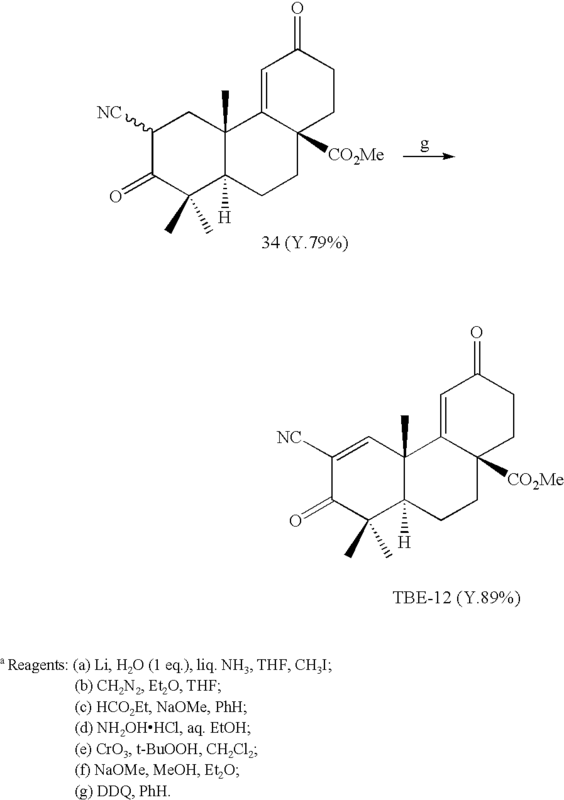 TBE-6 was obtained in 81% yield by cleavage of the isoxazole moiety of 21 with basic conditions, followed by DDQ oxidation. 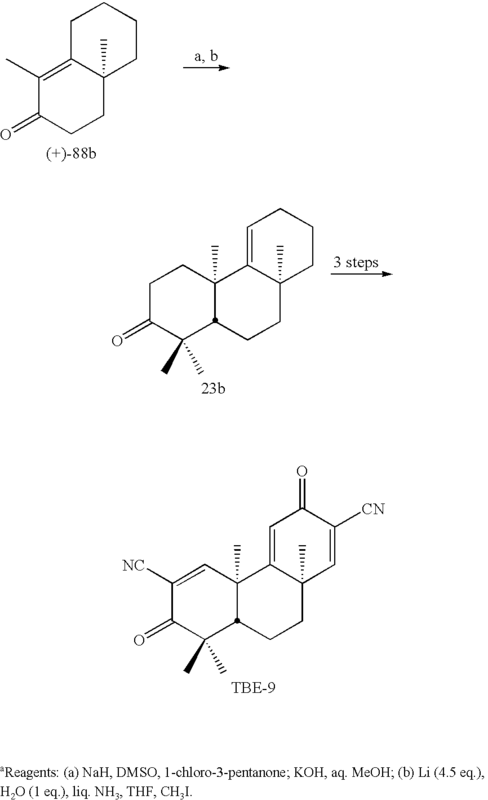 TBE-6 was synthesized in 13 steps (overall yield, 22%; average yield, 89% per step) from 6. Hydrolysis of TBE-6 with basic conditions gave TBE-7 in 77% yield. Amidation of TBE-6 with saturated ammonia in methanol gave TBE-8 in 64% yield. Dehydration of TBE-8 with thionyl chloride in toluene gave TBE-9 in 40% yield. The inventors found that TBE-9 attains the initial target potency (IC 50, 1 nM level) in the iNOS assay (Table 1). 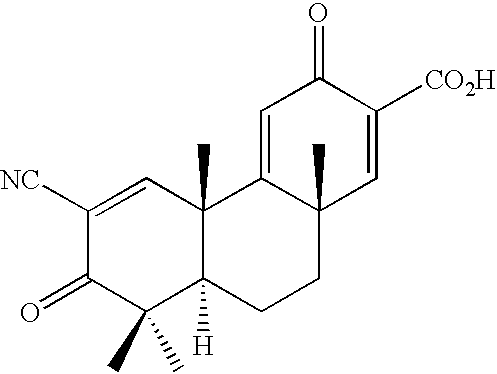 TBE-9 is about 5 and 30 times more potent than hydrocortisone and TBE-5, respectively. Further testing of TBE-9 indicates that the compound is orally active at 15 and 30 mg/kg in in vivo studies using mouse peritoneal inflammation induced by thioglycollate and IFN-gamma and shows no signs of toxicity at either dose (FIG. 5). These test also revealed that TBE-9 is much more potent than hydrocortisone. General Procedures. Melting points were determined on a Thomas-Hoover capillary melting point apparatus and are uncorrected. IR spectra were recorded on a Perkin-Elmer 600 series FTIR spectrophotometer. 1H (300 MHz) and 13C (75 MHz) NMR spectra were recorded on a Varian XL-300 Fourier transform spectrometer. The chemical shifts are reported in δ (ppm) using the δ 7.27 signal of CHCl3 (1H NMR) and the δ 77.23 signal of CDCl3 (13C NMR) as internal standards. Low-resolution mass spectra and high-resolution MS data were obtained on a Micromass 70-VSE. Elemental analyses were performed by Atlantic Microlab Inc. All samples prepared for elemental analysis or supplied for biological evaluation were dried at 50-60° C. at reduced pressure (≦0.1 Torr) in a National Appliance Company model 5831 vacuum oven. TLC was performed with Merck precoated TLC plates silica gel 60 F254. Flash column chromatography was done with Select Scientific silica gel (230-400 mesh). Ammonia gas was directed through a KOH drying tube into a 250 mL three-neck round bottom flask equipped with a stopper, dry ice/i-PrOH condenser connected to a nitrogen line, stir bar and dry ice/i-PrOH bath. The flow of gas was stopped after approximately 50 mL had been collected. Lithium (255 mg, 37 mmol, 4.5 eq, sliced ribbon), was washed with hexanes and added to the stirring solution, turning it a deep blue color. The solution was stirred at −78° C. for 20 min. Compound 26 (2.0 g, 8.2 mmol, 1 eq) and water (147 mg, 8.2 mmol, 1 eq) in freshly distilled THF (27 mL) were added dropwise and the solution was stirred at −33° C. (bp of ammonia) (with the aid of a CCl 4 bath) for 1 h. The solution was cooled to −78° C. and isoprene was injected until the blue color disappeared (approx 0.5 mL, 5.0 mmol, 0.6 eq), turning the solution white, followed by additional THF (10 mL). The dry ice condenser and bath was then removed from the system and as the reaction mixture rose to room temperature (RT), the ammonia was blown into a 5% HCl (aq.) trap solution as it evaporated with the aid of a nitrogen stream. To the remaining mixture were added iodomethane (10 mL, 160 mmol, 20 eq, d=2.28) and THF (10 mL) successively and the solution was stirred at 0° C. in an ice bath for 1 h. The solution was neutralized with 10% HCl (aq.) (20 mL) and the aqueous layer was extracted with CH2Cl2 (4×50 mL). The combined organic extracts were washed with brine (1×25 mL), dried over MgSO4, filtered and concentrated in vaccum to give 2.16 g of crude material. 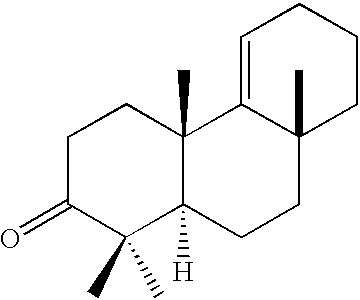 This off-white solid was purified by flash column chromatography [hexanes:EtOAc 7:1] to give compound 23 (1.34 g, 63%) as a colorless oil that gave semi solids upon standing: mp 34.5-35.5° C.; TLC [hexanes:EtOAc, 7:1] Rf 0.56; IR (KBr): 3049, 2929, 2864, 1707 cm−1; 1H NMR (CDCl3) δ 5.37 (1H, t, J=3.8 Hz), 2.71 (1H, ddd, J=6.7, 12.6, 15.9 Hz), 2.41 (1H, ddd, J=3.1, 6.0, 15.8 Hz), 2.09-2.03 (3H, m), 1.82-1.28 (10H, m), 1.25, 1.22 (3H each, s), 1.08 (6H, s); 13C NMR (CDCl3) δ 217.4, 152.0, 118.1, 54.4, 48.0, 43.0, 42.9, 39.2, 37.9, 35.0, 34.5, 28.6, 26.4, 25.9, 22.8, 21.8, 19.8, 18.3; EIMS (70 eV) m/z: 260 [M+] (48), 245 (70), 203 (36), 175 (42), 147 (52), 125 (100), 109 (83); HREIMS Calculated for C18H28O 260.2140, found: 260.2134. To liquid ammonia (100 mL) was added lithium (600 mg, 86 mmol, 7.2 eq, sliced ribbon), The solution was stirred at −78° C. for 40 min. Compound 30b (3.5 g, 12 mmol) and water (218 mg, 12 mmol, 1 eq) in freshly distilled THF (47 mL) was added dropwise and the solution was stirred at −33° C. (bp of ammonia) (with the aid of a CCl 4 bath) for 1 h. The solution was cooled to −78° C. and isoprene (approx. 1.25 mL,) was injected until the blue color disappeared turning the solution white. 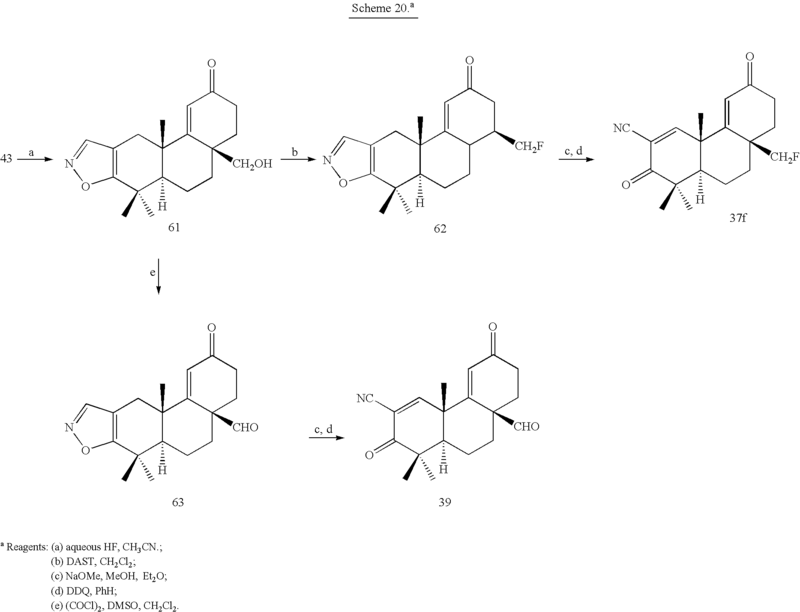 Subsequently, to the solution were added THF (17.5 mL) and iodomethane (17.5 mL) dropwise. The reaction mixture was stirred at −33° C. (bp of ammonia) for 1 h. The dry ice condenser and bath were then removed from the system and as the reaction mixture rose to rt, the ammonia was blown into a 5% HCl (aq.) trap solution as it evaporated with the aid of a nitrogen stream. The solution was neutralized with 10% HCl (aq.) and the aqueous layer was extracted with CH2Cl2 (4×50 mL). The combined organic extracts were washed with brine (1×25 mL), dried over MgSO4, filtered and concentrated in vacuo to give 3.8 g of crude material. A solution of the material in methylene chloride (100 mL) was extracted with 5% aqueous NaOH solution (2×25 mL) and water (1×25 mL). To acidify the aqueous extract was added 10% aqueous HCl solution. A colorless solid was precipitated. The acidic aqueous mixture was extracted with methylene chloride (3×25 mL). The extract was washed with water (3×25 mL), brine (1×25 mL), dried over MgSO4, and filtered. The filtrate was evaporated in vacuo to give acid 29a as an amorphous solid (1.33 g, 38%) The methylene chloride layer including neutral compounds was washed with saturated aqueous ammonium chloride solution (2×25 mL), brine (2×25 mL), dried over MgSO4, and filtered. The filtrate was evaporated in vacuo to give a residual oil (2.33 g). It was purified by flash column chromatography [hexanes:EtOAc 3:1, followed by 2:1] to give methyl ester 29b (547 mg, 15%) and alcohol 29c (1.21 g, 36%) as crystalline solids. Acid 29a: TLC: hexanes:EtOAc (2:1), R f 0.37. IR (KBr): 3200, 2943, 1691, 1457 cm−1. 1H NMR (CDCl3): δ 5.72 (1H, dd, J=3.1, 4.6 Hz), 2.73 (1H, ddd, J=6.3, 13.6, 15.8 Hz), 2.58 (1H, dt, J=3.2, 13.4 Hz), 2.41 (1H, ddd, J=3.0, 5.2, 15.8 Hz), 1.16, 1.06, 1.04 (3H each, s) 13C NMR (CDCl3): δ 217.0, 183.3, 144.5, 122.4, 54.5, 48.0, 45.5, 40.2, 38.34, 38.27, 36.8, 35.0, 25.8, 25.5, 22.2, 21.04, 21.03, 18.0. EIMS (70 eV) m/z: 290 [M+] (20), 245 (26), 91 (100). HREIMS: Calcd for C18H26O3 290.1882. Found: 290.1880. 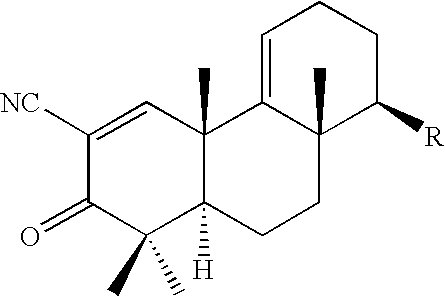 Methyl ester 29b: mp 90-92° C. TLC: hexanes:EtOAc (4:1), R f 0.56. IR (KBr): 2941, 2858, 1716, 1445 cm−1. 1H NMR (CDCl3): δ 5.68 (1H, dd, J=3.5, 4.6 Hz), 3.70 (3H, s), 2.73 m(1H, ddd, J=6.4, 13.6, 16.0 Hz), 2.60 (1H, dt, J=3.3, 13.3 Hz), 2.41 (1H, ddd, J=3.0, 5.2, 16.0 Hz), 1.06 (6H, s), 1.03 (3H, s). 13C NMR (CDCl3): δ 216.7, 177.4, 145.1, 121.8, 54.6, 51.9, 47.9, 45.6, 40.1, 38.6, 38.3, 36.8, 35.0, 25.8, 25.6, 22.1, 21.0, 20.0, 18.2. EIMS (70 eV) m/z: 304 [M+] (31), 245 (100), 159 (33). HREIMS: Calcd for C19H28O3 304.2038. Found: 304.2039. Alcohol 29c: mp 109-110° C. TLC: hexanes:EtOAc (2:1), R f 0.43. IR (KBr): 3454, 2931, 2859, 1645, 1448 cm−1. 1H NMR (CDCl3): δ 5.67 (1H, t, J=3.8 Hz), 3.68 (2H, s), 2.68 (1H, ddd, J=6.6, 12.5, 15.7 Hz), 2.43 (1H, ddd, J=3.3, 5.9, 15.7 Hz), 1.20 (1H, d, J=0.6 Hz), 1.08 (3H, s), 1.06 (3H, s). 13C NMR (CDCl3): δ 217.0, 148.0, 123.0, 67.0, 54.1, 47.9, 39.7, 39.0, 38.0, 37.1, 36.7, 34.9, 26.1, 26.0, 22.6, 21.8, 19.7, 18.1. EIMS (70 eV) m/z: 276 [M+] (6.1), 245 (100), 227 (10), 203 (6.1). HREIMS: Calcd for C18H28O2 276.2089. Found: 276.2082. 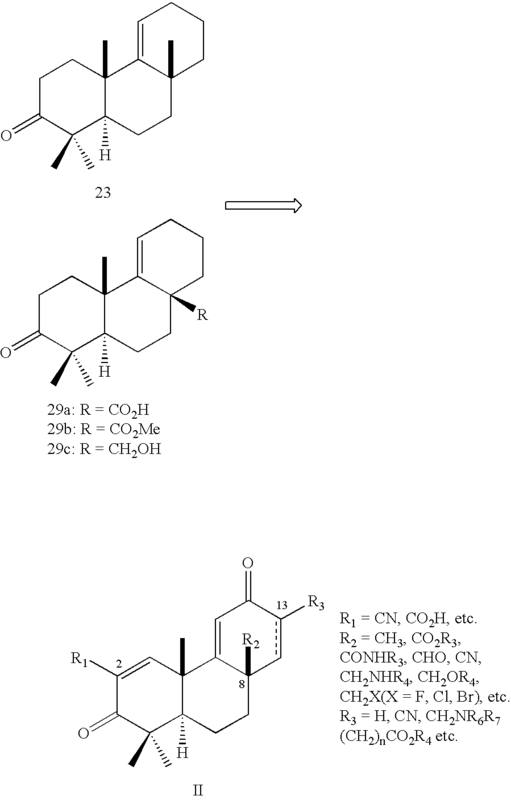 The inventors are interested in TBEs with functionalities at C-8 as shown above for the following reasons: (1) Starting materials 29a-29c for their syntheses can be easily made (see EXAMPLES 2 and 3) and (2) insertion of functionalities at C-8 of TBEs is expected to improve their potency and pharmacokinetics because the balance between hydrophilicity and hydrophobicity is shifted. Particularly, because TBEs with CO 2Na and NH3Cl moieties at C-8 (e.g., sodium salt of TBE-19, TBE-18, etc.) would be water-soluble compounds, they strongly affect such parameters. 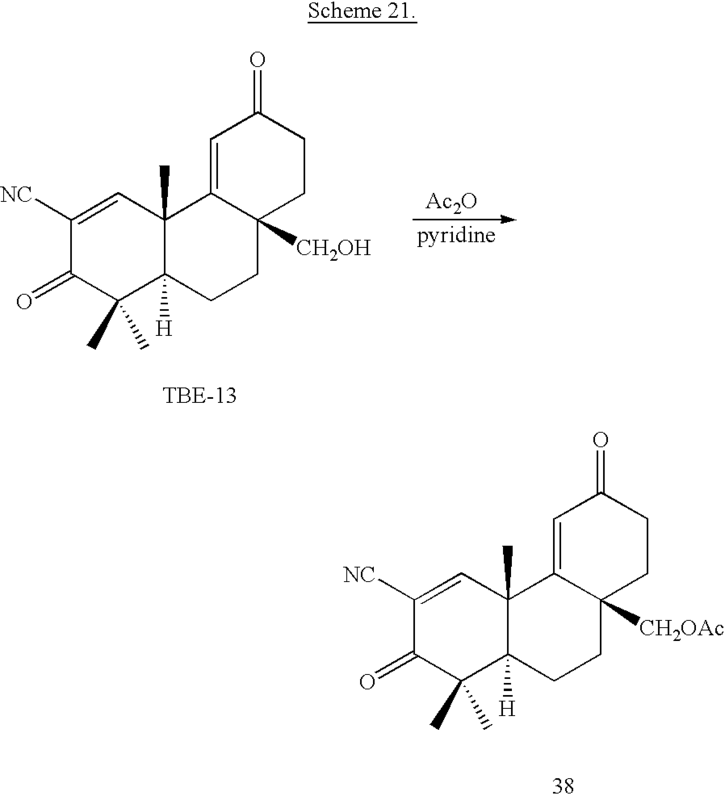 The inventors have synthesized novel TBE compounds, called TBE-12-19 (Schemes 14-18). 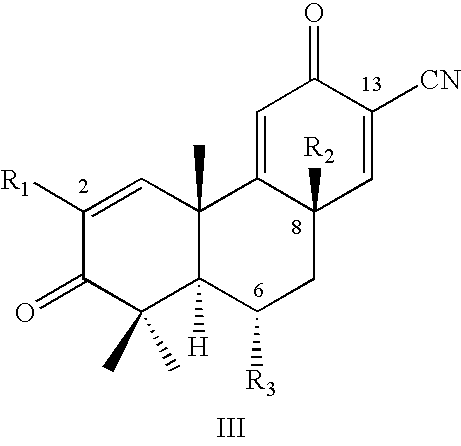 Also compounds 36-39 would be synthesized as shown in Schemes 19-21. Tert-butyl amide 45 was obtained in two steps from 29a in 61% yield. Neat POCl 3 gave 46 quantitatively. Formylation of 46 gave 47 in 88% yield. Isoxazole 48 was obtained from 47 in quantitative yield. Allylic oxidation of 48 gave 49 in 83% yield. Cleavage of isoxazole of 49 gave 50 in 88% yield. 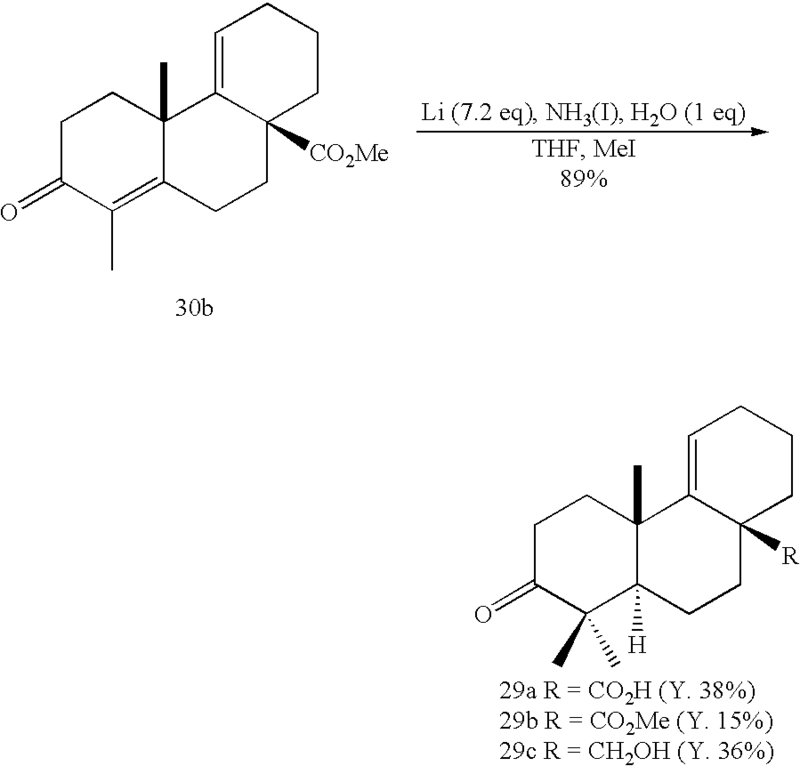 DDQ oxidation of 50 gave TBE-14 in 79% yield. Ketallization of 46 gave 51 in 88% yield. Reduction of nitrile group of 51 with a mixture of NaBH 4 and CoCl2 in methanol, followed by acidification with 10% aqueous HCl solution, gave 52 (yield based on recovered 46 and 51, 85%). Boc2O gave protected amine 53 in 73% yield. Formylation of 53 gave 54 in 99% yield. Condensation of 54 with hydroxylamine hydrochloride gave isoxazole 55 in 64% yield. Allylic oxidation of 55 gave 56 in 67% yield. TBE-16 was synthesized in two steps from 56 in 79% yield. Deprotection of TBE-16 with formic acid gave TBE-17, quantitatively. 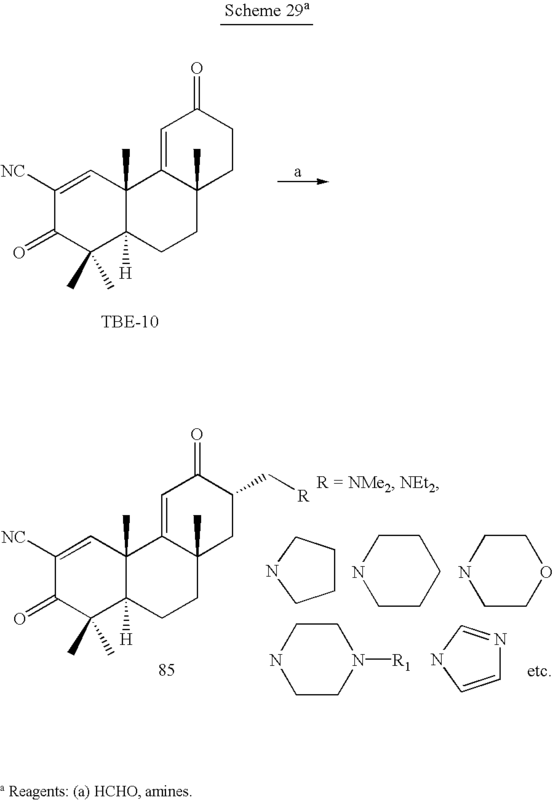 Deprotection of TBE-16 with hydrogen chloride in ether gave TBE-18, TBE-17 hydrochloride, quantitatively. TBE-18 should be soluble in water. 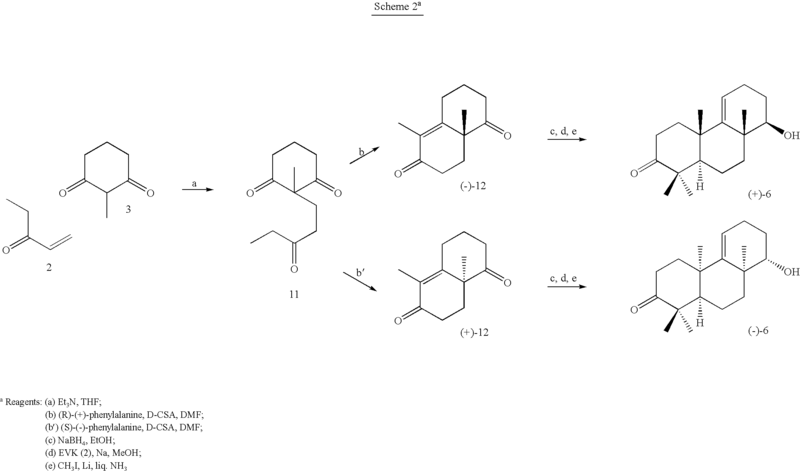 Reagents: (a) HCO 2Et, NaOMe, PhH; (b) NH2OH.HCl, aq EtOH; (c).CrO3, t-BuO2H, CH2Cl2; (d) NaOMe, Et2O, MeOH; (e) DDQ, PhH. Formylation of 29b gave 31 in 95% yield. Isoxazole 32 was obtained in 99% yield by condensation of 31 with hydroxylamine. 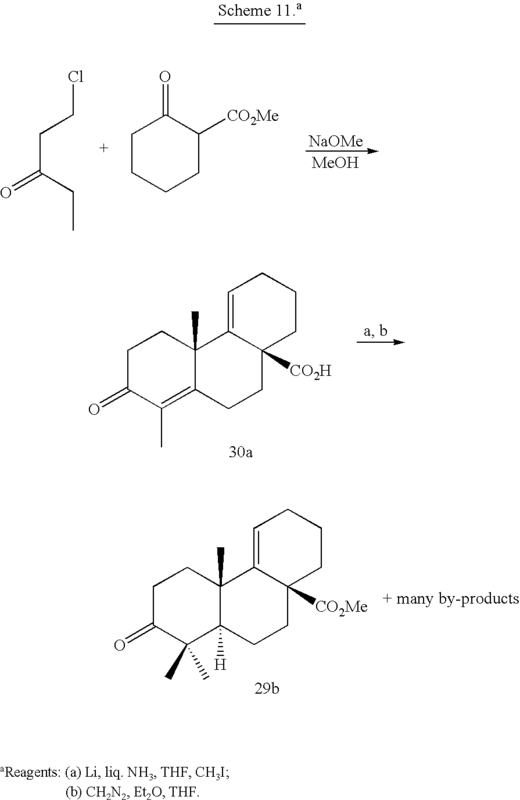 Allylic oxidation of 32 with a catalytic amount of CrO 3 and t-BuOOH gave enone 33 in 55% yield. Nitrile 34 was prepared in 79% yield by cleavage of isoxazole with sodium methoxide. DDQ oxidation of 34 gave TBE-12 in 89% yield. 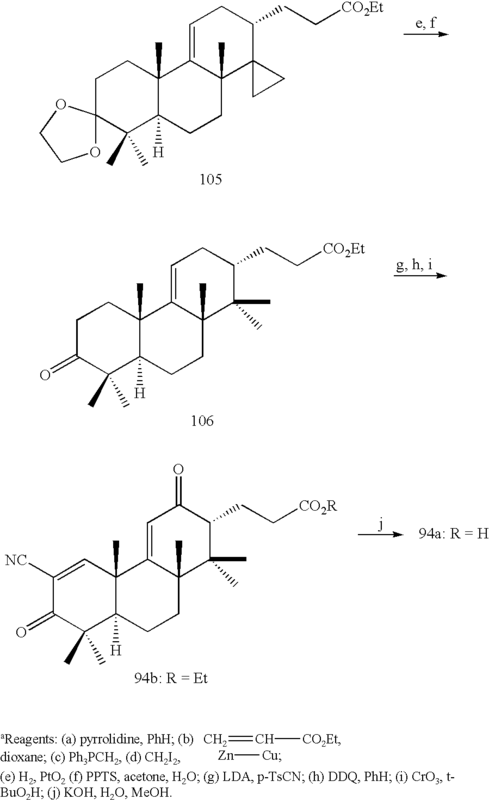 The inhibitory activities [IC 50 (μM) value] of racemic (±)-TBE-1-10, (−)- and (+)-TBE-5, oleanolic acid, and hydrocortisone (a positive control) on NO production induced by IFN-γ in mouse macrophages are shown in Table 1. The following results were obtained: (1) TBE-9 showed the highest potency in this assay. 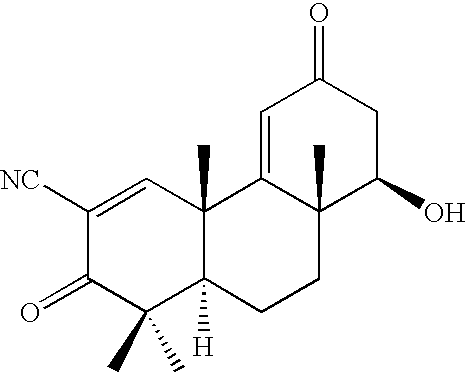 The potency of TBE-9 is about 5 and 30 times more than hydrocortisone and TBE-5, respectively. (2) TBE-10 is about 3 times more potent than TBE-5. This result is very important as it indicates that the 13-en-12-one functionality is not always necessary for potency. 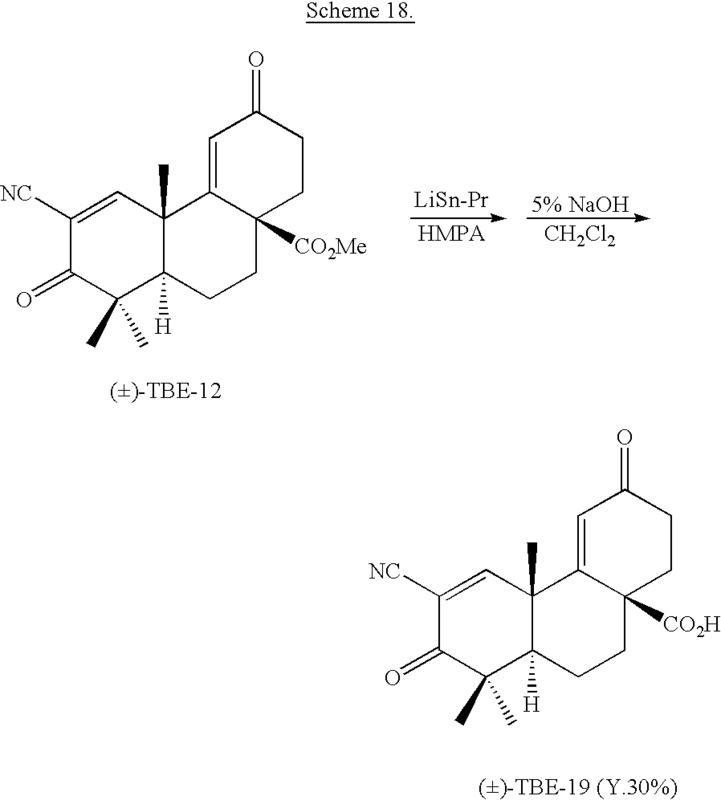 (3) As TBE-3 and 4 are more potent than TBE-1 and 2, the bis-enone structure is very important for high potency even in relatively small molecules. (4) Both enantiomers, (−)- and (+)-TBE-5 show the same potency. 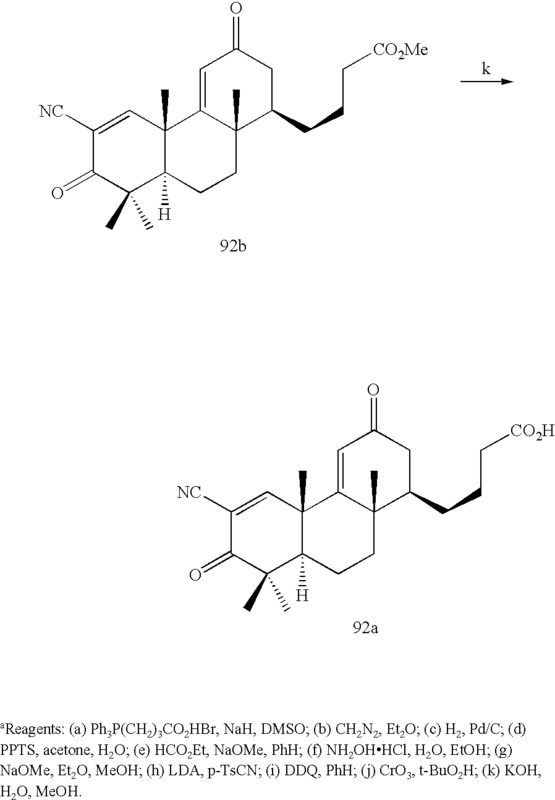 (5) It was also found that these TBE compounds do not act through the glucocorticoid receptor (data not shown). TBE-3 and 5 inhibit proliferation of NRP-152 prostate epithelial cells at the IC 50 10−7 M level (FIG. 4). 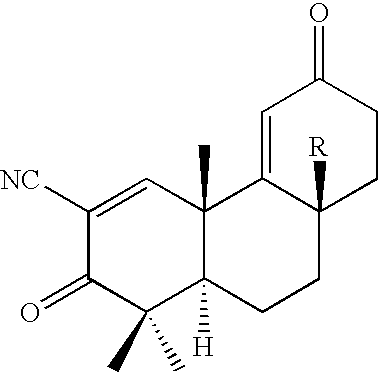 Alcohol 69 can be synthesized from 26 according to the synthetic route shown in Scheme 26. 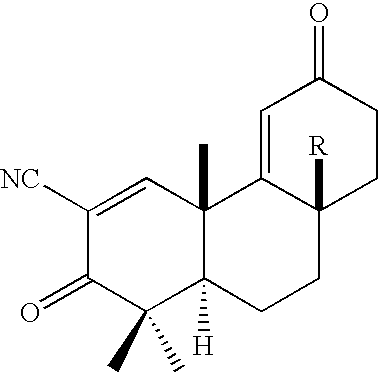 Compound 79 can be obtained from 26 with CH 3I in the presence of t-BuOK (for example, Snitman et al., 1978). 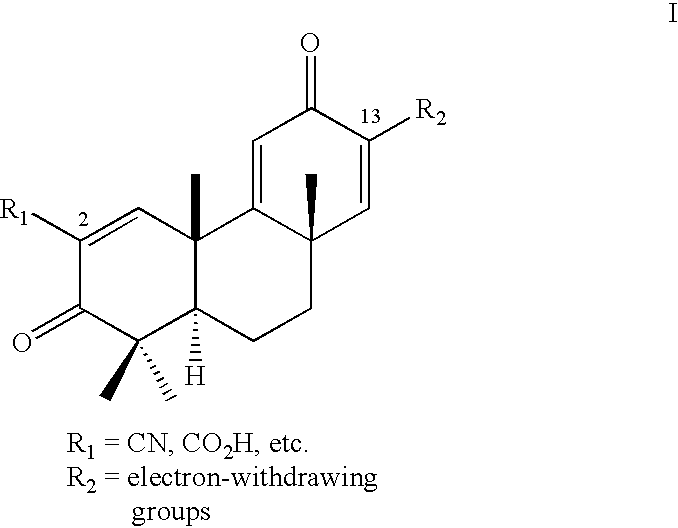 It has been reported that allylic oxidation at C-7 is very slow (Honda et al., 1981; Hirota et al., 1991), thus, enone 80 can be prepared selectively. Hydroboration would give 81 mainly because the β-face of the Δ5 double-bond is more hindered than the α-face. 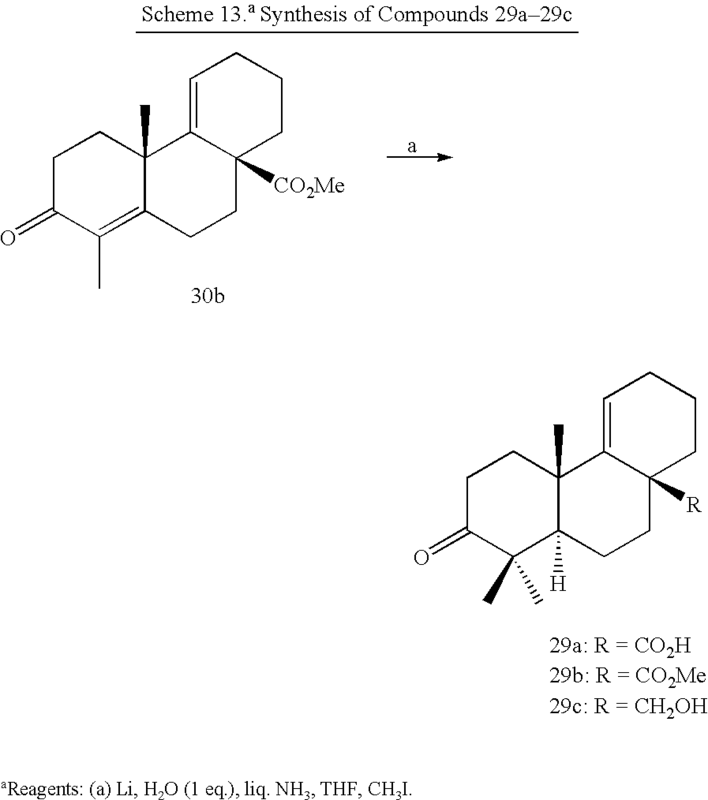 Using intermediate 107, which is synthesized from 5 with methyl iodide and potassium t-butoxide, TBEs with oxygenated functionalities in ring B having general formula VIa-c as shown above are envisioned and can be synthesized as discussed below. Insertion of oxygenated functionalities into ring B of TBEs is expected to improve their potency and pharmacokinetics because the balance between hydrophilicity and hydrophobicity is shifted. Proposed synthetic routes to specific compounds 108-110 are shown in Schemes 36 and 37. The inventors contemplate preparing both compounds 112 and 113 by selecting oxidation conditions. Compound 108 can be synthesized from 112. Epoxide 109 can be prepared by the same sequence using 113, followed by mCPBA oxidation. The mCPBA oxidation would give 109 predominantly because β-face of the Δ 5 double-bond of 117 is more hindered than the α-face. In Scheme 37, hydroboration would give 119 mainly because the Δ9(11) double-bond of 118 is seriously hindered and the β-face of the Δ5 double-bond is more hindered than the α-face. If these modifications increase the potency, the inventors contemplate designing and synthesizing water-soluble derivatives of these compounds with carboxyl and amino groups. Female CD-1 mice, 5-10 weeks of age were obtained from the Charles River Breeding Laboratories (Wilmington, Mass.). To obtain primary macrophages, female CD-1 mice were injected intraperitoneally with 2 mL of 4% thioglycollate broth (Difco Laboratories, Detroit, Mich.). Four days after injection, peritoneal macrophages were harvested and processed according to Bogden et al (1992). Cells were seeded in 96-well plates at 2×10 5 cells/well and incubated for 48 h with 10 ng/mL of IFN-γ in the presence or absence of inhibitory test compounds. For the evaluation of iNOS activation in vivo, female CD-1 mice were injected with 2 mL of 4% thioglycollate broth 3 days before IFN-γ stimulation. On day 3, test compounds were prepared in 0.1 mL volume of solvent mixture (DMSO: Ethanol: Water=2:2:1) and gavaged once to mice (6 per group). Then, 1 hr later, IFN-γ (0.5 μg/mouse) was given intraperitoneally. Ten hours after IFN-γ stimulation, mice were sacrificed, and peritoneal macrophages were collected and plated in 6-well plates. Cells were kept in incubators with 5% CO 2 at 37° C. for 12 hrs. The accumulation of nitric oxide in the supernatant was measured by the Griess reaction, as described above. To obtain total proteins, cells were washed and scraped into cold PBS, and then centrifuged at 500 g for 10 min at 4° C. The cell pellets were resuspended in 50 mM Tris-buffer (pH 7.4), and 100 mM NaCl, containing 0.5% of NP-40, 5 μg/mL of aprotinin, 10 μg/mL of leupeptin and 100 μM of PMSF, and then centrifuged to obtain whole cell lysates. The proteins (20-50 μg) were electrophoresed on 7.5% reducing SDS-PAGE and transferred in 20% methanol, 25 mM Tris, 192 mM glycine (pH 8.3) to 0.2 micron nitrocellulose membranes. The membranes were blocked with 5% non-fat milk in Tris-buffered saline (25 mM Tris, pH 7.5, 150 mM NaCl, 0.02% NaN3) with 0.2% Tween-20 (Tween-TBS) for 1 h, then incubated with antibody to iNOS for 2-3 h, washed and finally incubated for 45 min with a 1:10,000 dilution of secondary antibody conjugated with horseradish peroxidase. The membranes were washed and then developed using a chemiluminescence system (enhanced chemiluminescence detection reagents; Amersham). Assays are available to show activity in suppressing inflammation in vivo (ip, po and iv). The simplest assay for this purpose is to demonstrate that a new TBE can block the activation of macrophages (induced by interferon-γ) in the peritoneal cavity of mice. Mice will be injected ip with thioglycollate to stimulate the formation of macrophages, and these will be activated by ip injection of interferon-γ. A second in vivo system in which to text TBEs for suppression of macrophage activation is the granulomatous hepatitis model that has been used by Nathan and colleagues (Nicholson et al., 1999; MacMicking et al., 1995, all incorporated herein by reference). In this model, mice are injected ip with heat killed bacteria ( Proionabacterium acnes), which results in the recruitment and activation of macrophages in the liver to form a granulomatous lesion. If such mice are challenged with LPS a week after injection with Propionobacterium acnes, they show a greatly enhanced response to LPS, as can be measured by high serum levels of nitrate plus nitrite (products of iNOS activity). The inventors will use TBEs to block the original formation of lesions in the liver as well as to block the response of activated liver macrophages to LPS. A third in vivo test is to evaluate the potency of TBEs against lethal inflammation of C57BL/6 mice caused by oral infection with Toxoplasma gondii. This model has been used by Dr. Kasper, Department of Medicine and Microbiology, Dartmouth Medical School, and colleagues (for example, Khan et al., 1997; Lee et al., 1999; Buzoni-Gatel et al., 1999; 2001, all incorporated herein by reference). Because overproduction of IFN-γ and synthesis of NO mediate this inflammation, inhibitors of production of NO like TBEs are expected to prevent early death in these mice. Suppression of NF-κB activation by TBEs can be determined according to the methods described in Suh et al., (1998), incorporated herein by reference, using standard gel shift assays (EMSAs). Briefly, nuclear proteins can be extracted from macrophages or other cells by detergent lysis and then incubated with a  32P-labeled NF-κB oligonucleotide probe containing an NF-κB response element, followed by gel shift analysis. For the new TBEs, one can determine dose-response, kinetics of action, and interactions with other known effectors. Ability to block specific inducers of NF-κB activation, such as interferon-γ, TNF-α, LPS, phorbol ester, etc. can be measured. The inventors contemplate adopting two approaches in the study of effects of TBEs on events leading to the degradation of IκB and activation of NF-κB. These two well characterized kinases that lead to the phosphorylation of IκB, namely IKK (IκB kinase), which phosphorylates IκB directly, and NIK (NF-κB inducing kinase), which can phosphorylate IKK to enhance its kinase activity. Phosphorylated GST-IκB can be detected either using  32P-labeled ATP in kinase assay, or using a phospho-IκB specific antibody through Western analysis. Ausubel et al.,  In: Current Protocols in Molecular Biology, John, Wiley & Sons, Inc, NY, 1994. Baldwin,  Annu. Rev. Immunol., 14649-681, 1996. Bargou et al.,  J. Clin. Invest., 100:2961-2969, 1997. Barkett and Golmore,  Oncogene, 18:6910-6924, 1999. Barnes and Karin,  N. Engl. J. Med., 336:1066-1071, 1997. Beal,  Curr. Opin. 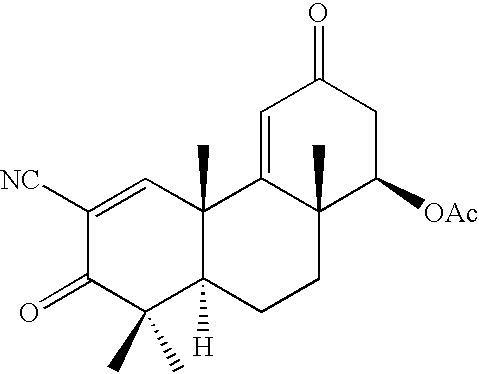 Neurobiol., 6(5):661-666, 1996. Bogdan et al.,  J. Biol. 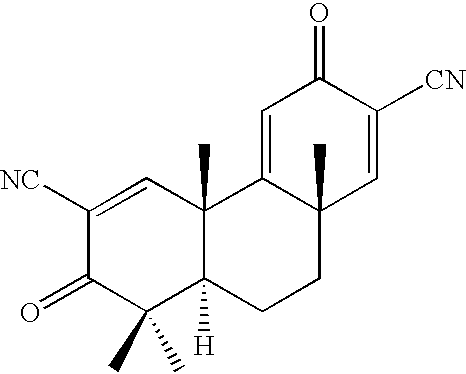 Chem., 267:23301-23308, 1992. Buzoni-Gatel et al.,  Gastroenterology, 120:914-924, 2001. Buzoni-Gatel et al.,  J. Immunol., 162:5846-5852, 1999. Caine,  In: Organic Reactions; John Wiley & Sons, Inc., NY, 23:258, 1976. Clinton et al.,  J. Am. Chem. Soc., 83:1478-1491, 1961. Dale et al.,  J. Org. 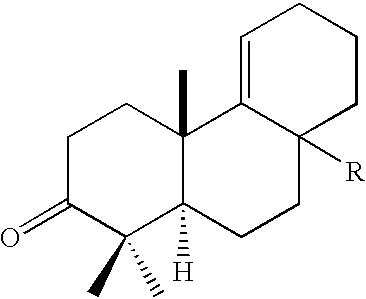 Chem., 34:2543-2549, 1969. Dean et al.,  Lancet., 2(7416):769-770, 1965. Ding et al.,  J. Immunol., 940-944, 1990. DuBios et al.,  Gastroenterology, 110: 1259-1262, 1996. DuBois et al.,  Cancer Res., 56(4):733-737, 1996. Dutcher et al.,  J. Org. Chem., 41:2663-2669, 1976. Finkbeiner et al.,  J. Am. Chem. Soc., 85:616-622, 1963. 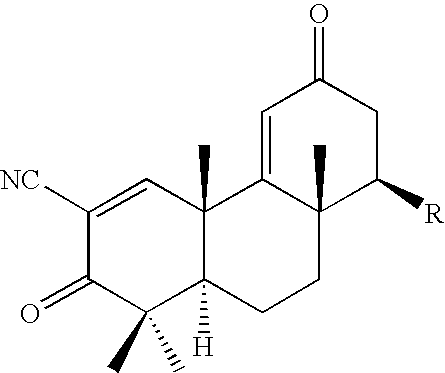 Gait et al., In:  Oligonucleotide Synthesis, 1984. Genain and Hauser,  J. Mol. Med., 75(3):187-197, 1997. 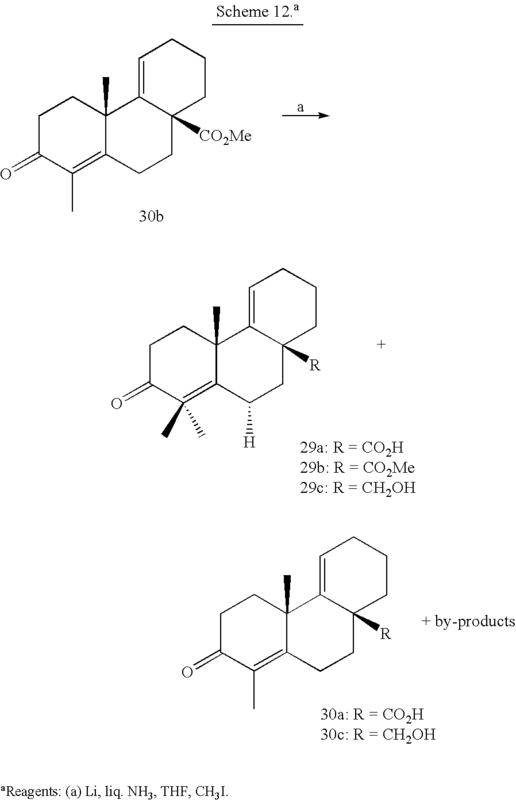 Ghosh et al.,  Annu Rev Immunol., 16:225-60, 1998. Grieco et al.,  J. Org. 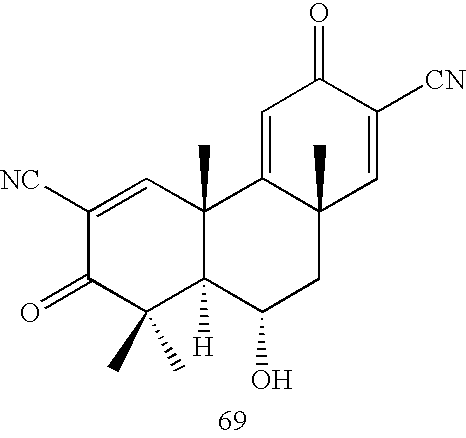 Chem., 63:5929-5936, 1998. Guttridge et al.i,  Mol. Cell. 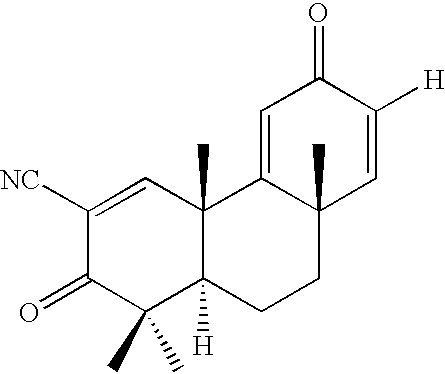 Biol., 19:5785-5799, 1999. Hagiwara et al.,  J. Org. 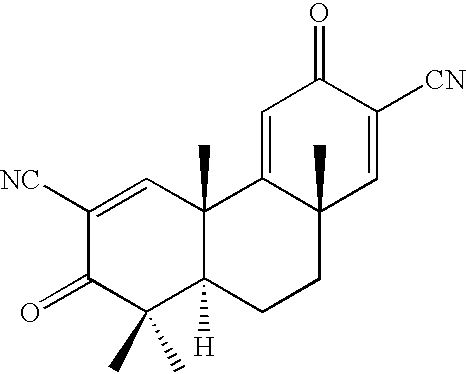 Chem., 53:2308-2311, 1988. Hames and Higgins, In:  Nucleic Acid Hybridization, 1984. Heathcock et al.,  J. Org. 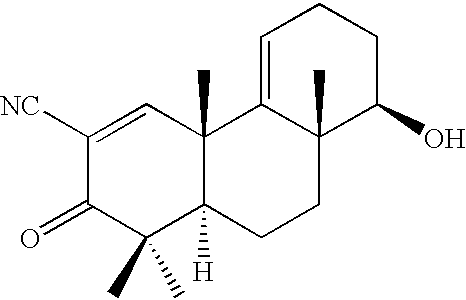 Chem., 49:3264-3274, 1984. Hinz et al.i,  Mol. Cell. Biol., 19:2690-2698, 1999. Hirota et al.,  Agric. Biol. 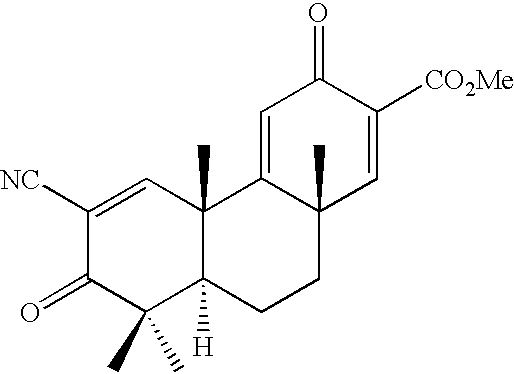 Chem., 54:1073-1075, 1990. Hirota et al.,  Bull. Chem. Soc. Jpn., 61:4023-4028, 1988. Hirota et al.,  J. Org. Chem., 56:1119-1127, 1991. Honda et al.,  Chem. Lett., 299-302, 1981. Honda et al.,  J. Med. Chem., 43:4233-4246, 2000. Honda, et al.,  J. Med. Chem., 43:1866-1877, 2000. Huang et al.,  Nat. Struct. Biol., 7:634-638, 2000. Javin et al.,  Tetrahedron Asym. 8:1101-1109, 1997. Johnson et al. J. Am. Chem. Soc., 67:1745-1754, 1945. Joyce et al.,  J. Biol. 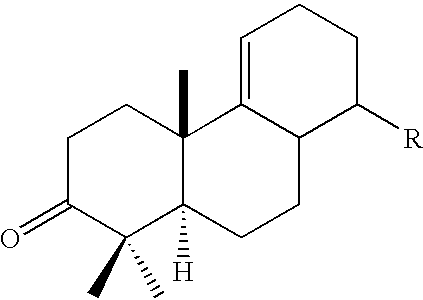 Chem., 274:25245-25249, 1999. Kahne and Collum,  Tetrahedron Lett., 22:5011-5014, 1981. Kaltschmidt et al.,  Proc. Natl. Acad. Sci. USA, 94(6):2642-2647, 1997. Kerwin et al.,  J. Org. Chem., 52:1686-1695, 1987. Khan et al.,  Proc. Natl. Acad. Sci. USA, 94:13955-13960, 1997. Lee et al.,  Experimental Parasitology, 91:212-221, 1999. MacMicking et al.,  Cell, 81:641-650, 1995. Mayer and Walker, In:  Methods In Enzymology, Academic Press, Inc., NY, 1987. Merrill and Benvenist,  Trends Neurosci., 19(8):331-338, 1996. Miller, In:  Experiments in Molecular Genetics, Cold Spring Harbor Press, Cold Spring Harbor, N.Y., 1972. Moncada et al. i,  Pharmacol. Rev., 43:109-141, 1991. Muzart,  Tetrahedron Lett., 28:4665-4668, 1987. Nicholson et al.,  Shock, 11:253-258, 1999. Oppolzer and Godel,  J. Am. Chem. Soc., 100:2583-2584, 1978. Oshima et al.,  Cell, 87(5):803-809, 1996. Prescott and White,  Cell, 87(5):783-786, 1996. Rasmussen et al.,  J. Org. Chem., 46:4843-4846, 1981. Rayet and Gelinas,  Oncogene, 18:6938-6947, 1999. Rossi et al.,  Nature, 403:103-108, 2000. Salvemini et al.,  J. Clin. Invest., 93:1940-1947, 1994. Sambrook et. al., In:  Molecular Cloning: A Laboratory Manual, 2nd. Ed., Cold Spring Harbor Laboratory Press, Cold Spring Harbor, N.Y., 1989. Sheng et al.,  Gastroenterology, 113(6):1883-18891, 1997. 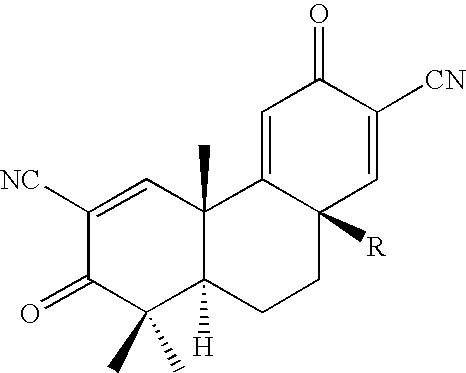 Singh et al.,  J. Pharm. 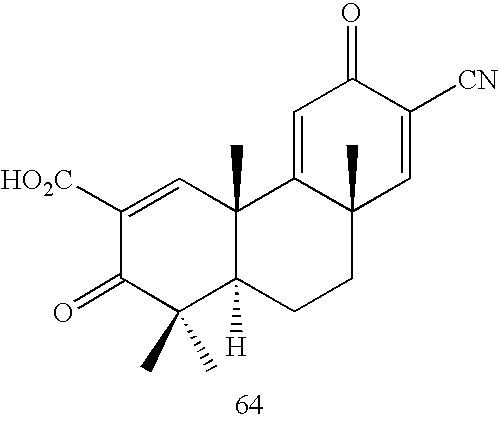 Pharmacol., 44:456-458, 1992. Snitman et al.,  Synth. Comm., 8:187-194, 1978. Sporn and Roberts,  J. Cvlin. Invest., 78:329-332, 1986. Srikrishna et al.,  Tetrahedron, 54:11517-11524, 1998. Stork et al.,  J. Am. Chem. Soc., 85:207-222, 1963. Strejan et al.,  J. Neuroimmunol., 7:27, 1984. 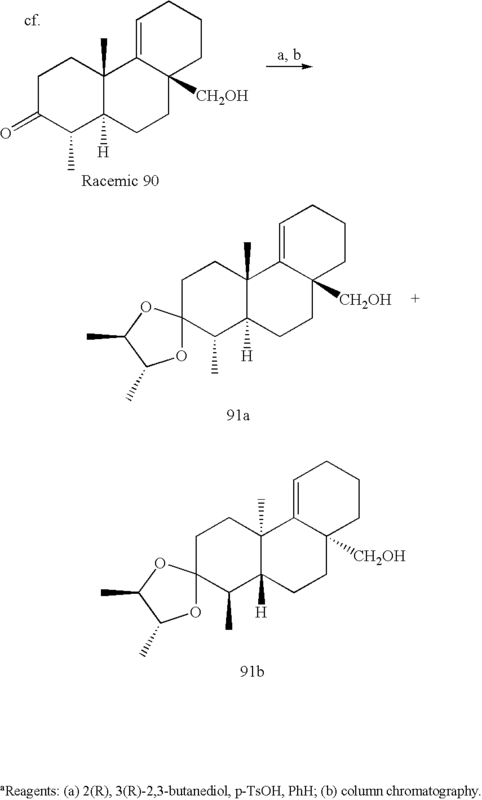 Suh et al.,  Cancer Res., 59(2):336-41, 1999. Suh et al.,  Cancer Research, 58:717-723, 1998. 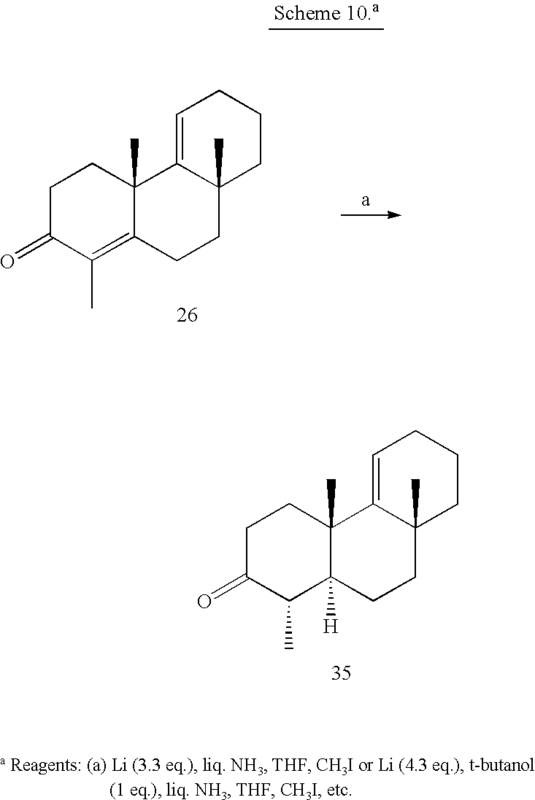 Takahashi et al.i,  Cancer Res., 57:1233-1237, 1997. Tsujii and DuBois,  Cell, 83(3):493-501, 1995. Weir and Blackerll, In:  Handbook Of Experimental Immunology, Volumes I-IV, 1986. Williams et al.,  Clin. Neurosci., 2(3-4):229-245, 1994.
or a pharmaceutical salt or formulation thereof. or a pharmaceutically acceptable formulation thereof. 22. 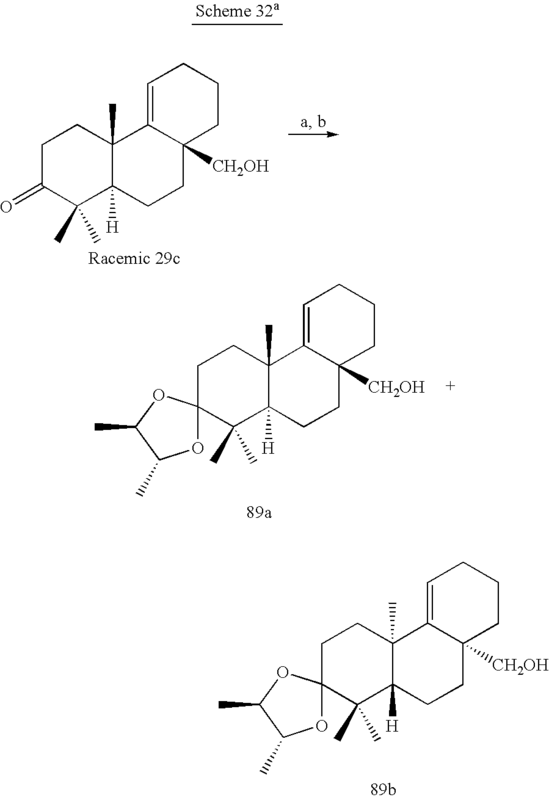 A tricyclic-bis-enone composition effective for inhibiting IFN-γ-induced NO production in macrophages or RAW cells, said composition having an IC50 value of at least less than 0.7 μM. 23. The composition of claim 22, wherein said composition has an IC50 value of at least less than 0.001 μM. 24. The composition of claim 22, wherein said compound is optically pure. 25. The composition of claim 22, wherein said compound is predominantly the (+) enantiomer. 26. 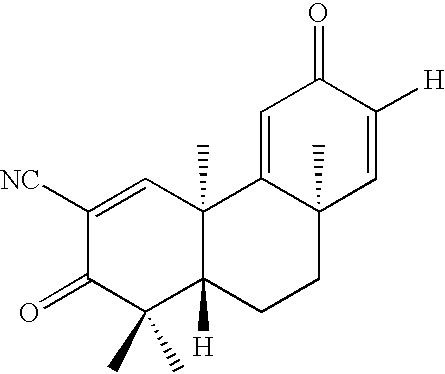 The composition of claim 22, wherein said compound is predominantly the (−) enantiomer. 27. The composition of claim 22, wherein said compound is a racemic mixture. 28. The composition of claim 22, wherein said compound is water soluble. 30. The method of claim 29, wherein said disease is a cancer. 31. The method of claim 30, wherein said cancer is brain, lung, liver, spleen, kidney, lymph node, small intestine, pancreas, blood cell, bone, colon, stomach, bread, endometrium, prostate, testicle, ovary, central nervous system, skin, head and neck, esophagus, or bone marrow cancer. 32. The method of claim 30, wherein said cancer is epithelial cancer. 33. The method of claim 31, wherein said cancer is lung, colon, breast or prostate cancer. 34. The method of claim 33, wherein said cancer is colon cancer. 35. The method of claim 30, wherein the patient is further defined as one that has been identified as having a high risk for the development of the cancer. 36. The method of claim 29, wherein the disease is an inflammatory disease. 37. The method of claim 36, wherein said inflammatory disease is rheumatoid arthritis, or inflammatory bowel disease. 38. The method of claim 29, wherein the disease is a neurodegenerative disease. 39. The method of claim 38, wherein said neurodegenerative disease is Alzheimer's disease, Parkinson's disease, multiple sclerosis or amyotrophic lateral sclerosis. 40. The method of claim 29, wherein the patient is further defined as having a condition or having the propensity to develop a condition involving the over expression of COX-2 or iNOS genes or gene products. 41. The method of claim 29, wherein said compound is optically pure. 42. 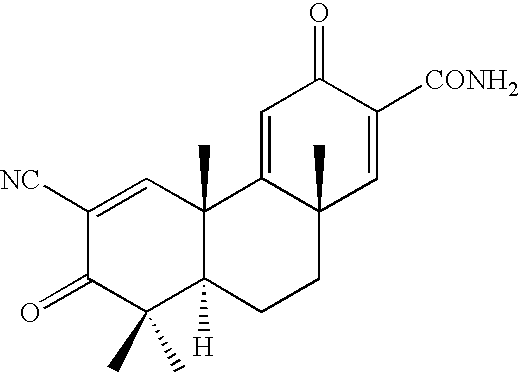 The method of claim 29, wherein said compound is predominantly the (+) enantiomer. 43. The method of claim 29, wherein said compound is predominantly the (−) enantiomer. 44. The method of claim 29, wherein said compound is a racemic mixture. 45. The method of claim 29, wherein said compound is administered as an aqueous solution. 46. The method of claim 29, wherein the therapeutically effective amount is 0.1-1000 mg/kg. 47. The method of claim 29, wherein an additional therapeutic agent is administered to said patient. 49. The method of claim 48, wherein said compound is optically pure. 50. The method of claim 48, wherein said compound is predominantly the (+) enantiomer. 51. The method of claim 48, wherein said compound is predominantly the (−) enantiomer. 52. The method of claim 48, wherein said compound is a racemic mixture. 54. The method of claim 53, wherein said compound is optically pure. 55. The method of claim 53, wherein said compound is predominantly the (+) enantiomer. 56. 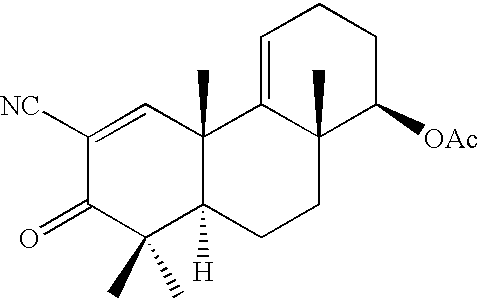 The method of claim 53, wherein said compound is predominantly the (−) enantiomer. 57. The method of claim 53, wherein said compound is a racemic mixture. 59. The method of claim 58, wherein said compound is optically pure. 60. The method of claim 58, wherein said compound is predominantly the (+) enantiomer. 61. 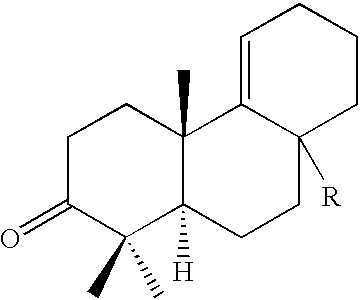 The method of claim 58, wherein said compound is predominantly the enantiomer. 62. The method of claim 58, wherein said compound is a racemic mixture.